We live-blogged as the Supreme Court released opinions in two cases: Obduskey v. McCarthy & Holthus LLP and Frank v. Gaos. 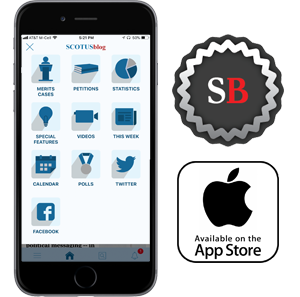 SCOTUSblog is sponsored by Casetext: A more intelligent way to search the law. Why have two opinion days in a row? By my count, the Court is being asked to overturn four cases/lines of precedent this Term: (1) the separate-sovereigns exception; (2) Auer/Seminole Rock; (3) Nevada v. Hall; and (4) Williamson County. Which of those do you think is least likely to be overturned? Also, I would tell you that I am sorry that I am not live blogging from the Court today, except that I am live blogging from the southern part of heaven, Chapel Hill, North Carolina. So I am not all that sorry. The Court spreads out the opinion-release days to give the Reporter's Office time to complete the syllabi, etc., and for the Publications Unit to get all the prints ready, etc. I've got my sittings calendars with all of my notes, sct opinions page open, and tea. I'm ready for some opinions! We are only waiting on one more opinion from the October sitting (which should not be confused with arguments, like Frank v. Gaos, that were argued in October but are part of the November sitting). Justice Sonia Sotomayor is the only justice who has not yet written an opinion from the October sitting, so she likely has Gundy v. United States. @AmyHowe Are you The Flash? That's a long way to run to SCOTUS and back to your computer! There are comments asking about the likelihood of various decisions coming out today, which means it's a good time to insert my usual warnings about how we don't know how many opinions we are getting or which ones. Quick question: Who writes the syllabus pages at the beginning of each opinion? Is it the chambers of the Justice who has written the opinion itself? @amyhowe on a serious note, and you've probably answered this and I apologize for forgetting, but do you normally get a heads up from the court saying "Hey we might have opinions this day you might wanna stay tuned"? Any chance we could hear about Home Depot today? I was not at the oral argument in Gundy so I can't say much about what the prospect that Sotomayor is writing might mean for the outcome in the case. Hopefully we will know soon. And if not, I'll try to do some research before the next live blog. Ariane de Vogue of CNN is reporting just one box of opinions waiting to be distributed at the Court today, which means (in all likelihood) a smaller number of opinions. PS: Application deadline is today! We have the first opinion, from Justice Breyer in Obduskey v. McCarthy & Holthus. It is unanimous, with Sotomayor concurring. The decision of the Tenth Circuit is affirmed. Here's a link to the court's opinion in Obduskey. Danielle D'Onfro will have our analysis. The court holds that a business that only engages in nonjudicial foreclosure proceedings is generally not a "debt collector" for purposes of the Fair Debt Collection Practices Act, except for the purposes of one limited provision of the act. This was a case in which a homeowner was alleging that a law firm hired to carry out a foreclosure proceeding outside of court failed to comply with the FDCPA. Next up is a per curiam opinion in Frank v. Gaos. Per curiam means unsigned, by the way. The court is sending Frank v. Gaos back to the lower courts for them to address the plaintiffs' legal right to sue in light of the Supreme Court's 2016 decision in Spokeo v. Robbins. "We are a court of review, not of first view," the opinion says. Also, the court says that "Nothing in our opinion should be interpreted as expressing a view on any particular resolution" of the question of the legal right to sue, known as "standing." I assume the CJ announces the per curiams? Frank v. Gaos was a challenge to the use of cy pres awards in class actions, which means that some or all of the proceeds go to charity. In Spokeo, the court held that "standing" -- the right to sue -- requires an actual injury, even if there is a violation of a statute. And so the question that the Court is asking the lower courts to decide in Frank v Gaos is whether the plaintiffs in the class action have a right to sue. Per curiam is Latin for "by the court." Not "unsigned" though it is an unsigned opinion. 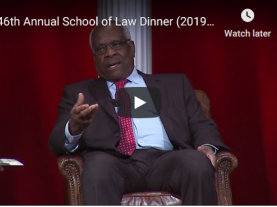 Justice Thomas dissented from the per curiam opinion. He would reach the merits and reverse. Are any more opinions coming on this one-box day? The Court page hasn't updated and I can't imagine Gaos took much time to summarize. Thanks! Are the ScotusTalk podcasts available as an Apple podcast or just on SoundCloud? Interesting - Frank v. Gaos doesn't have a syllabus. Is this normal for Per Curiam opinions? That appears to be all for today. Do we know when the oral arguments in Flowers' will begin? Also, is there a way to live stream the oral arguments or do we have to wait to listen? The "We are a court of review, not of first view" is a quote from a 2005 opinion. Hard for Gorsuch to have authored that line then. why are some per curium opinions announced, others issued with the order list? The "court of review, not of first view" is, in fact, a line from Justice Ginsburg's opinion in Cutter v. Wilkinson. 544 U. S. 709, 718 n.7 (2005). It's quoted in the per curium. When are the next round of possible opinion days? ~200 people in the public line to get in for OA at about 6:00am when I showed up, totally underestimated the public interest in this case. Death penalty + podcast = Should have tried to attend Monday or Tuesday. Thanks to everyone who joined us today. We don't know for sure, but we'll likely be back again on Tuesday for opinions. Have a great week! Is Citizenship question on the Census being heard? do you know about how long it takes between the slip opinions and the version of the opinion that gets released in the Supreme Court reporter? It is curious to see how the two newest justices were split on a couple of yesterday's opinions. Could this be a sign that the justices differ in a lot of smaller aspects of law? what is the SCOTUSblog header art today? 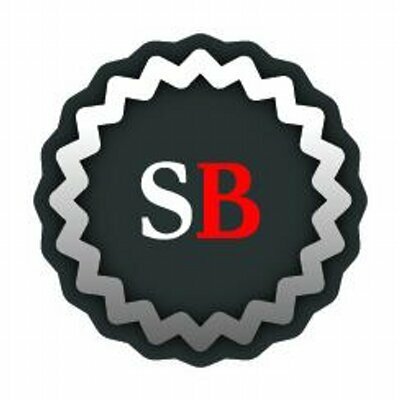 @wes: I think it is a reference to Flowers v. Mississippi. Andrew Hamm (I wish we could reply to replies), a while back I researched whether "review not first view" originated with the Cutter footnote, and I don't recall ever finding anything to the contrary. A quick search reveals the earliest instance of "court of review, not of first view," "review, not first view," or "review not first view" is in Cutter, so it looks like J. Ginsburg did indeed coin the catchy phrase. Obviously, the sentiment has been around much longer than 2005 though. Alright all, we are going to shut this one down. Thank you as always for joining us! Today we'll have our analyses of these two opinions, plus Amy's analysis of today's argument in Flowers v. Mississippi and her preview of next week's Kisor v. Wilkie. Hope to be back with you next week for more opinions! Final plug for the pre-law in your life!